London-based regtech ClauseMatch is expanding into Asia with the launch of operations in Singapore. The firm told FinTech Futures it already serves clients with presence in Singapore, including Barclays and Revolut, with local entities using ClauseMatch for their compliance in the region. The firm’s Software-as-a-Service (SaaS) based offering automates compliance management for banks and financial institutions (FIs). Founded by CEO Evgeny Likhoded, ClauseMatch’s solution is based on his experience working in legal and compliance roles at Morgan Stanley and Gazprom UK. It recently announced a partnership with the digital bank Revolut, in preparation for Revolut’s expansion to Singapore, Australia and the US. The company was first introduced to the market as part of the DIT Singapore mission. ClauseMatch joined industry discussions within the DIT events, which helped it to better understand the specifics of the market. 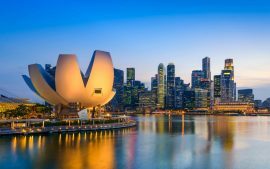 Moreover, with APAC’s regulatory environment very fragmented, Singapore maintains a highly regulated market that possesses a great degree of affinity with the UK’s own regulations. As part of its international expansion, ClauseMatch has partnered with RegPac Revolution, the regtech ecosystem platform in Singapore, to leverage its extensive professional connectivity in APAC markets.